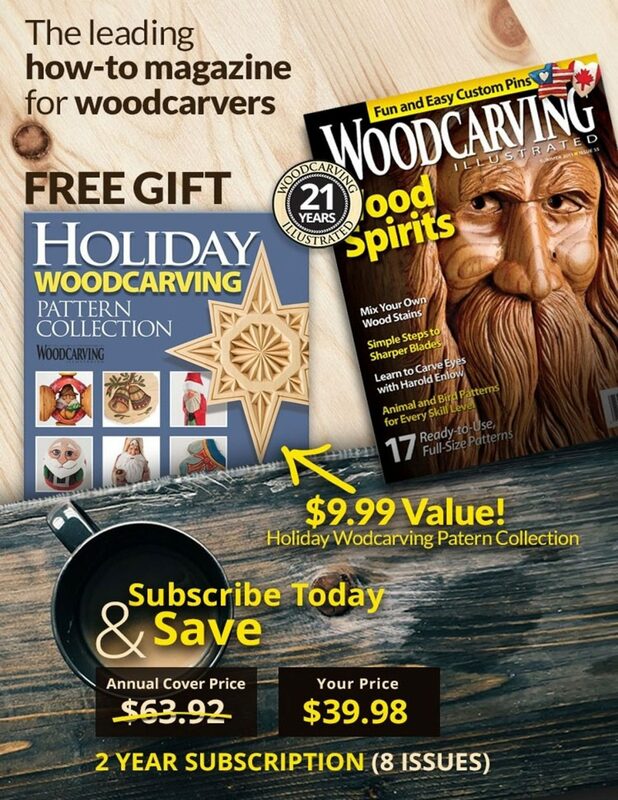 A sharp carving tool is the first requirement for successful and happy carving. A dull tool will not produce clean cuts and creates a greater risk of injury. 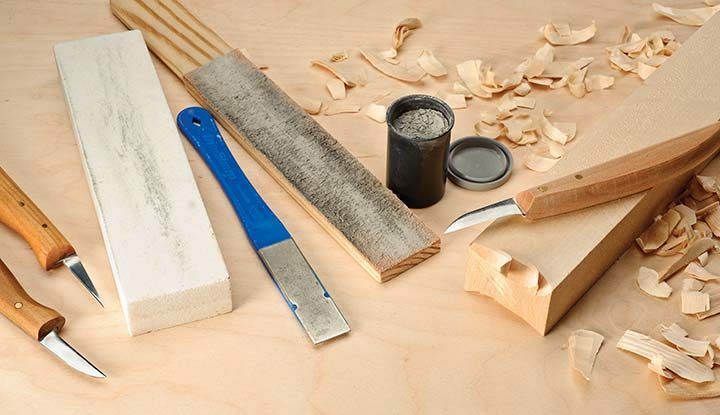 Fortunately, there is a simple method to sharpen your carving tools and keep them sharp. To understand sharpening, you must first understand the bevel. The bevel is the shape taken by the thick supporting metal of the blade as it thins down to the fine cutting edge. The bevel, or cutting angle, can be long or short depending on the type of tool and the steel in the tool. The bevel length determines the strength of the blade. As the bevel becomes longer, the cutting edge becomes thinner. With a long thin bevel, the fibers of the wood may be hard enough to damage the cutting edge. The majority of carving knives are intended for soft wood and have a long thin bevel that extends the width of the blade. This type of bevel is called a straight bevel. There are other types of bevels, but most carving knives have a straight bevel to provide the most efficient cutting and the greatest strength to the edge in relation to the sharpness of the knife. There are many sharpening devices available and they all work. For this demonstration, I am using a flat oil stone, but I also use a diamond hone. Stones come in different grits from fine to coarse. Other sharpening devices, such as sandpaper, work the same. 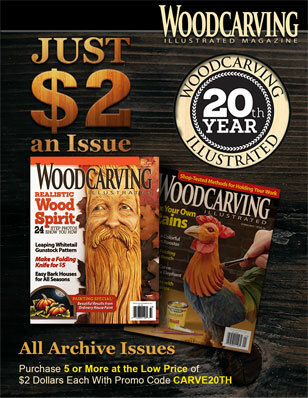 For a complete range of sharpening supplies, visit www.woodcarvers.com. All sharpening is based on creating a wire edge along the cutting edge of the bevel. The wire edge, also called a burr, is the result of sharpening the bevel until it is very thin at its cutting edge. The wire edge shows up as a shiny line along the bevel on the side opposite the one you are sharpening. You will strop more than you sharpen. Using a leather strop is a good way to keep a sharp edge on your knife. I use a 2 1/2″-wide by 10 1/2″-long strop. The leather should be very thin and have the fuzzy side out. I never put oil on my strop. 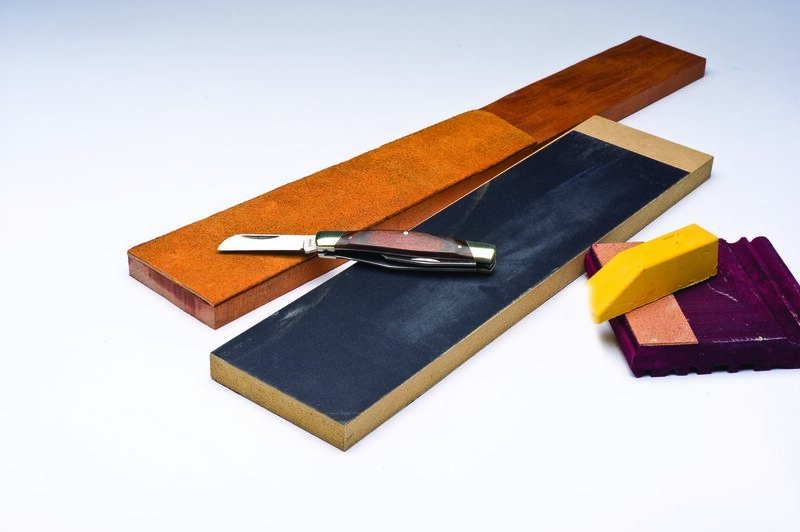 Begin by coating the strop lightly with a strop abrasive. 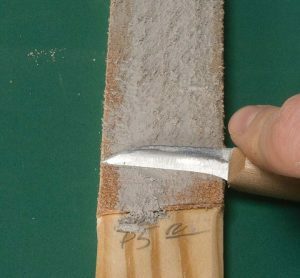 Use the back of your knife to rub the abrasive into the strop. Do not re-sharpen a knife once it is sharp unless necessary. You will be wasting metal needlessly. If you break, chip, or round the blade, you will need to re-sharpen. Otherwise, frequent stropping is all that is needed. Think of the barber and his leather strop—he keeps the razor sharp with just stropping. Keep the knife flat along the bevel while you strop. 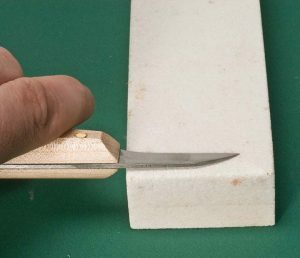 If you lift the knife blade while stropping, you could round the edge of the blade, creating a secondary bevel that will stop the cutting action.